If you're an Oregon resident, you can execute a valid self-made last will and testament, provided you adhere to the state's laws concerning will formalities. If you don't execute your will according to Oregon's prescribed formalities, your will could end up being declared invalid. If that happens, your property is then divided among your heirs according to Oregon's laws of intestate succession. Oregon, like other states, has laws that dictate how a will must be executed. In other words, the state mandates that "testators," or will makers, adhere to certain formalities when making a will. In Oregon, a testator must be at least 18 years old and have "testamentary capacity;" this means she must be mentally capable of identifying the significance of making a last will and testament. Oregon law requires wills to be witnessed by at least two people; your witnesses must watch you sign your will and must sign your will in your presence and in the presence of one another. Some states don't allow a will to be witnessed by a person who stands to benefit from the will in some way. However, Oregon allows for "interested" witnesses, meaning one or both of the witnesses can also be a beneficiary of the will. Oregon residents are allowed to make their own wills -- that is, an Oregon resident may make a will without hiring an attorney. The state's laws explain that a will must be written. In other words, a will cannot be oral, but it can be self-made as long as it's in writing. Oregon does not, however, recognize holographic wills, which are wills that are handwritten by a testator, but not witnessed. Thus, as an Oregon resident, you can execute a valid self-made will, provided it's typed or written by hand and witnessed. If you're considering executing a self-made will, understanding how you may divide property is important. Oregon allows testators to completely disinherit children; however, a testator may not completely disinherit his spouse. This is because some property acquired during marriage is considered shared by both spouses. For example, if you're married and you attempt to bequeath the marital home you share with your spouse to a third party, a probate court may declare the bequest invalid. In other words, you can't devise or bequeath property that isn't 100 percent yours. If you're going to execute a self-made will in Oregon, the law allows you to include a "no contest" clause. When included in a will, these clauses prohibit beneficiaries from contesting the will, lest they lose their inheritance. If your will is left open for contest due to failure to comply with state law -- that is, if you lacked capacity or failed to have your will witnessed -- and an Oregon probate court finds it invalid, your property is then divided pursuant to the state's laws of intestate succession. Laws of intestate succession provide a default scheme for the division of property if a person dies without a will or with an invalid will. Oregon's laws of intestate succession provide that a surviving spouse has priority over other relatives. 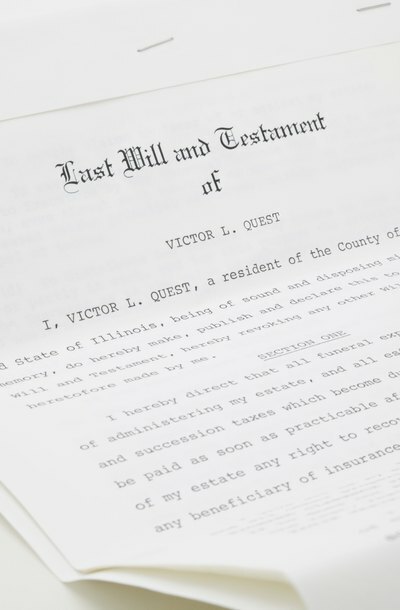 Thus, if you make an invalid will or fail to make a will, your surviving spouse will inherit your entire estate; if you have children and a surviving spouse, your children and surviving spouse will inherit your estate. OregonLive.com: Reader Questions -- Does Oregon Honor Handwritten or Holographic Wills? Are Homemade Wills Legal in Texas?